The mural on the south and west exterior walls (in color - not black and white) by Chapel Hill mural artist Michael Brown was commissioned by Manbites Dog Theater when they moved into the building in 1998, and depicts a stylized reflection of the downtown Durham skyline at that time. It references the works of surrealist artist René Magritte, particularly L'Empire des Lumières. Another Magritte-influenced mural by Michael Brown can be seen two blocks east on the south-facing walls of the TROSA building (formerly Old North Durham Graded School). The one-story brick, flat-roof rectangular building was built ca. 1947 for Walton Roofing and Heating Company. It is not listed in the 1944-1947 Durham City Directory but is listed the 1950- 1951 directory. The three-bay-wide east façade has Flemish bond brick with glazed headers, while side and rear elevations have running bond brick. The south elevation has four metal casement windows with concrete sills and two doors that open onto a metal loading dock. The north elevation, accessible by a narrow paved alley, has a single metal door. The rear elevation has a single bricked-up window. The center recessed front entrance is a replacement glazed door. The flanking large display windows have concrete sills and replacement plate-glass. A vintage red and white striped metal awning shades the windows. The façade wall extends as a stepped parapet, with concrete coping. 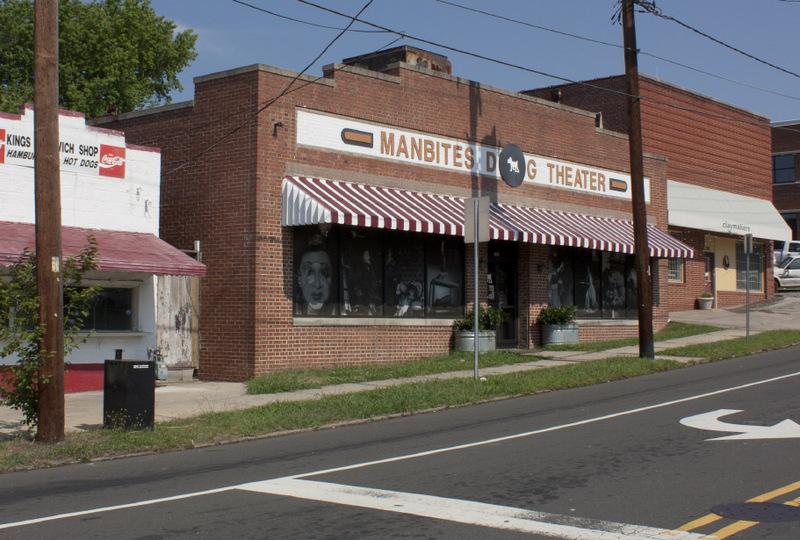 A wide recessed panel in the upper façade is painted white and has a painted sign: "Manbites Dog Theater." The independent theatre company performs original plays in a theatre housed in the rear two-thirds of the building, which has an arched roof. A bold black and white mural along the south and rear walls depict the skyline of the surrounding urban neighborhood.